Have you ever held greatness in the palm of your hand? Have you ever clasped something so small, so beautifully delicate, the words ‘my precious’ escaped your lips? I have. I wondered who could have crafted such a wonder, what mad genius designed this thing that now rested on my fingertips. I could not find a person, but a place: California, a land synonymous with innovation. Home to companies like Apple, Google, Facebook, and countless others. Companies that gave us the iPhone, the Facebook, the Juicero. But I’m not referring to any of those products. I’m referring to another company entirely, one whose incessant innovations are often overshadowed by the tech juggernauts of the valley. I am referring to Taco Bell. The company who gave us the Cool Ranch Doritos Locos Taco because eating Doritos on the side was simply not good enough. The company who saw how lonely the quesadilla and the burrito were by themselves and married them into the Quesaritto. And the company whose unbridled ambition has now led them to the Naked Chicken Chips, an attempt to create a harmonious fusion of fried chicken, and fried chip. An attempt that should be applauded, but one that ultimately falls short. 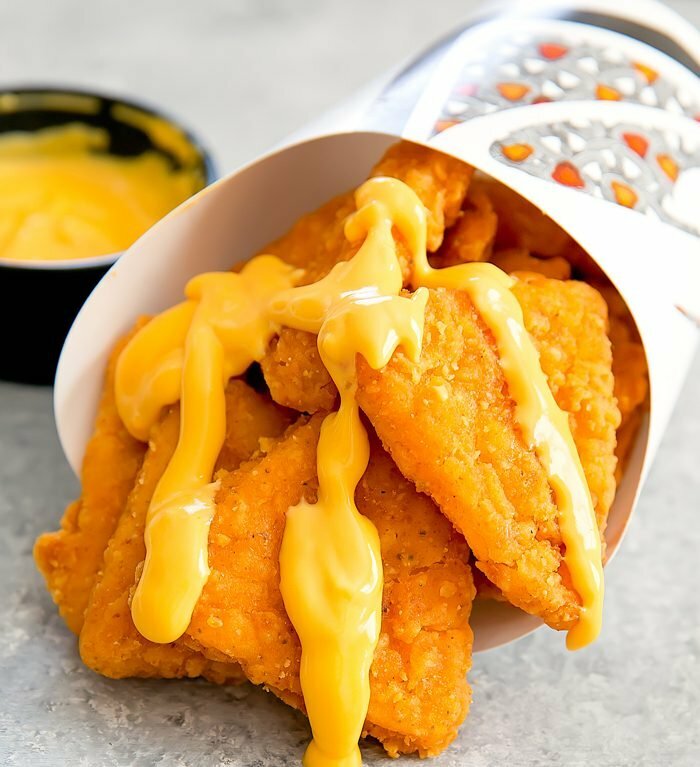 The Naked Chicken Chips do rise to the standard of presentation and taste everyone expects from Taco Bell, but fail to capture the essence of deep fried chicken they are supposed to be derived from. As a former Taco Bell employee, I can tell you the presentation of their “Mexican Inspired” cuisine matters. On my second day I was stuffing burritos during dinner rush, the drive-thru line stretching out of the parking lot. With every new order on screen the visual attractiveness of my burritos gradually transitioned from Matthew McConaughey in Magic Mike to Matthew McConaughey in Dallas Buyers Club. I tossed one burrito into a bag and then felt my boss grab me by the arm. I avoided eye contact and pulled the burrito from its hiding place, revealing a wrinkled mess of a wrap. “How does that look to you?” He asked. “This,” I said, looking down at my creation the way Mama Fratelli might have looked at Chunk. “Wrap it again,” he said, and proceeded to watch as I re-wrapped the burrito, ignorant to the flurry of motion around us as people desperately tried to fill orders. He watched until the wrap was perfect, wrinkle free and accurately labeled. And he instructed me never to let my standards slip to the frail DBC McConaughey again. The presentation of the Naked Chicken Chips would have lived up to my boss’s standards. It was plated on a clean plastic tray free of imperfections, two cups of nacho cheese resting to the right, and a clear lid with the iconic TB logo engraved in the center. Removing the lid lets out a waft of steam bringing the smell of seasoned chicken to your nose and revealing the Naked Chicken Chips themselves. They are stacked in a three dimensional mosaic of breaded chicken, with the same varying shades of orange you’d find in a sunset. A sunset you can eat. And when you’re eating the sunset that is the Naked Chicken Chips, it’s impossible not to think of the deep fried chicken they supposedly evolved from. When judging the quality of breaded chicken bathed in boiling grease, there is really on one adjective that matters, and that is crispy. Yes, it’s important for chicken to be tender. Yes, it’s important for it to be moist, perhaps even succulent, if you’re in the mood for a fancier synonym. But above all else it must be crispy. And this is where the Food Scientists at Taco Bell truly missed the mark. You wanna know how to tell if something is crispy? I’ll tell you. Take a bite of it and tell me what you hear. Was there a distinctive crunch rivaling The Bell’s own Dorito shell? Or was there a soft nothingness like a 6” flatbread that was tragically steamed too long? Properly crisped chicken will be loud. It will be uncomfortable to eat in polite company, or at a funeral. Taco Bell’s Naked Chicken Chips, however, are silent. I could have snacked on them as pallbearers carried out the casket and no one would have been the wiser. Even a librarian, the ones with their hair tucked up into a bun and glasses dangling around their neck would have approved of the silence of my snack. I’m tempted to say the Naked Chicken Chips were soggy, but that would be hyperbolic. The Naked Chicken Chips were simply soft, like biting into a warm stick of butter. One might question whether they even rise above the level of a Chicken Nugget, which I suspect might be TB’s secret inspiration. They certainly lack the crispiness that is the defining characteristic of both fried chicken and tortilla chips. The Naked Chicken Chip doesn’t entirely abandon its tortilla chip heritage, however. Like mashed potatoes without gravy, pancakes without syrup, or Matthew McConaughey without abs, nacho chips would be nothing without nacho cheese. The higher ups at T-Bell were smart to include their signature nacho cheese as a companion to the Naked Chicken Chips. A companion that perhaps erases any other transgression committed by the chips. Is there anything that cannot be improved by an excess of nacho cheese? Surely there is, but I have yet to discover it. At this point you are certainly wondering how I could have avoided talking about taste for so long. Is that not the most important quality when judging any food? Indeed it is. And I’ll admit my previous comment suggesting the Naked Chicken Chips were at all similar to the Chicken Nugget might have been an impassioned exaggeration, one I sincerely apologize for. McDonald’s menu just can’t elicit the same level of excitement in one’s taste buds the way Taco Bell’s can. And the Naked Chicken Chips are no different. 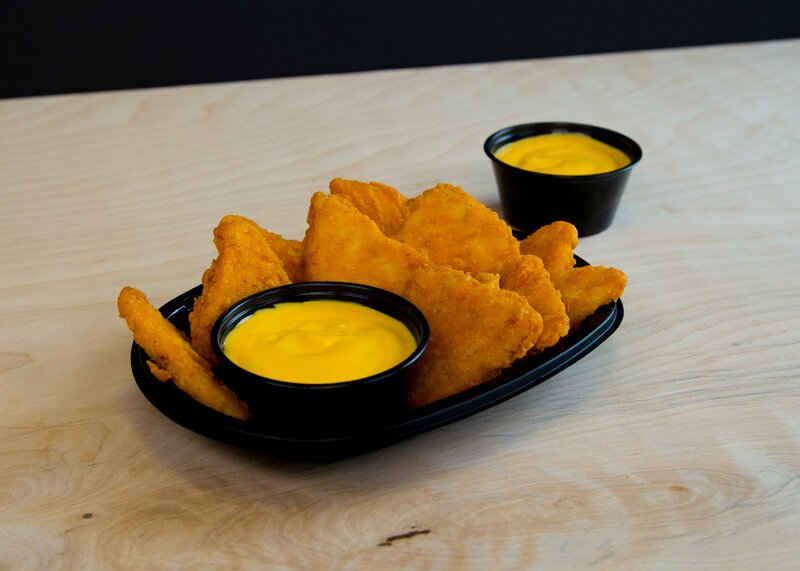 An army of chicken nuggets doused in your favorite sauce could not rival the seasoned perfection of the Naked Chicken Chip. How much T-Bell pays their Taste Engineers, I do not know, but I assure you they are richer than I. And for as much as I lauded T-Bell’s inclusion of nacho cheese, the truth is that it is wholly unnecessary. The flavor of the Naked Chicken Chip stands on its own, capable of making your tongue dance more than spin-the-bottle. And in a world of bland burgers and excessively salted fries, perhaps taste is all that matters. I could let the Naked Chicken Chips off easy and continue on comparing them to their lackluster equivalents in the fast food industry. But Taco Bell holds themselves to a higher standard, and I shall do the same. In the long line of Taco Bell’s greatest innovations, the Naked Chicken Chips are little more than their Silicon Valley parallel, the iPhone 5S. They reach the standard of taste we’ve all come to expect from Taco Bell, but they fail to revolutionize fast food the way their predecessors have. The attempt to fuse together the best parts of a tortilla chip and deep fried chicken is one that should be admired, but also one that falls short and lacks the crispiness essential to the soul of fried chicken. However, while the innovation and execution might not rival Doritos Locos Shell or the original iPhone, the Naked Chicken Chips are worthy of their modest three dollar price tag and a coveted spot on Taco Bell’s menu. To all of you reading this, I encourage to find your nearest Taco Bell and try the Naked Chicken Chips for yourself. But be forewarned: Taco Bell is a cruel mistress, one who giveth, and one who taketh away. I learned this lesson the hard way when my first love, the Volcano Burrito, was discontinued. I understand you can still order the Cheesy Bean and Rice Burrito with double meat and have the base ingredients of a Volcano Burrito. But what about the Lava Sauce? Am I just supposed to order it with Creamy Jalapeño sauce instead and pretend that’s somehow the same? No. Absolutely not. That would be an insult to everything the Volcano menu stood for. And like the Volcano menu before it, the Naked Chicken Chips will soon join the graveyard of discontinued menu items. Perhaps in magical Disney fashion, Taco Bell will one day open up the Vault and for a limited time bring back their most beloved creations. But in the event that never happens, I suggest you race to your nearest Taco Bell and try them for yourselves, before it’s too late. It has now been six months since T-Bell welcomed our lightly breaded friend to the menu, and since then they have shown a steadfast commitment to the chicken-chip hybrid. In fact, the Taste Engineers have gone so far as to take their classic Quesadilla and impregnate it with the Naked Chicken Chip, thus giving birth to the Crispy Chicken Quesadilla. Knowing TB’s obsession with splicing together fan favorites, I would have expected nothing less. (Notably absent from this pairing is a side of nacho cheese, a forgivable oversight.) While one can never be too wary of The Bell’s fickle nature, perhaps this fusion of the old with the new is a sign that the Naked Chicken Chips are here to stay.